You wake up, turn on your phone and even before the morning coffee you are scrolling down your Instagram feed to see what’s new. Well, this might not be everyone’s morning routine. But Instagram is undoubtedly one of the most used platforms for creators to share their work and interact with their audience. For Blythe doll customizers this is no different. Most use Instagram, and the majority is doing a great job. 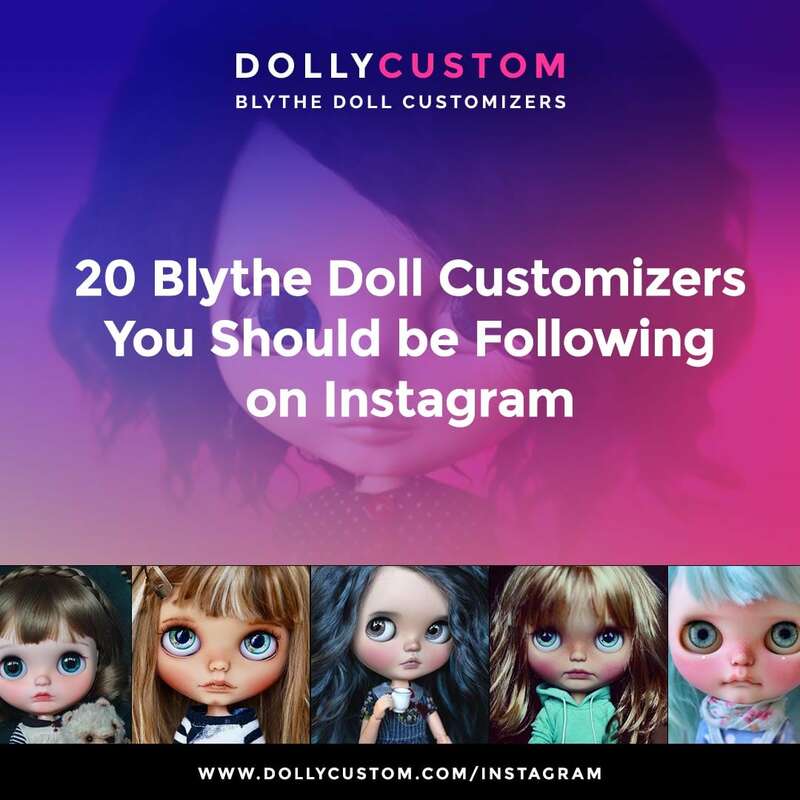 Yes, this is this site Instagram’s account and made up of 100% custom Blythe dolls. I know, it’s a shameful plug, but I had to do it. DollyCustom promotes creators and their work, so click and follow this one to support the project. Ken is a Blythe doll customizer from China and one with the most following on Instagram. His dolls are sweet and beautiful, and he showcases them for our delights regularly. It’s no wonder that Coral’s Instagram account is one of the most successful. Her cute dollies participate in her activities and are so funny to watch. Cihui Estrada posts her cute curly girls regularly and some tiny snippets of her life. But mostly her girls. One of the most prolific Blythe doll customizers has an astounding Instagram feed where you can spend some time in contemplation. Just like Babycatface dollies, Sara Torres from hola gominola has a delicious feed where her dolls share their adventures or show off their striking beauty. One of the most elusive customizers out there, wanwan creates the sweetest dolls from the other side of the ocean. Even though not represented on the DollyCustom site (yet), she’s one of the most admired customizers, and you will know why if you check out her photos. Tiina shares her amazingly perfect dolls and lots of behind the scenes of her customizing work on her Instagram. She’s a must follow, very active mixing a little of everyday life with her dolly world. Olga and her sweeties are also a must follow in the customizers universe. She inspires us with her girly dolls and beautiful photographs. Isa is another Spanish customizer that does the sweetest dolls and acessories and places them in cute settings. Another inspiration to follow on Instagram. Casey brings us her exquisitely made dolls, details, some life snippets and a little of nature. Her Instagram feed will inspire you with its beauty. Iris, from Beijing in China, present us beautiful dolls, settings and behind the scenes. Her exquisite dolls mix and match with other photos of her works, always beautiful and creative. Lita and her naughty Asian girls will delight you and want to make you scroll through her feed. She is a marvelous customizer with multiple styles and a vast amount of work. A calm and poetic feed that showcases Jan Yong dolls, a Blythe doll customizer from Singapore. She’s working on this art form since 2014, and her personality shines throughout all she does. Juan and his perfectly arranged Instagram feed. Perhaps one of the most well-cared and planned as he displays his photos as he does them: by color. I could spend an entire day just looking at his images. Not only custom dolls but 100% incredible work! Susana is one of the most loved and participative customizers out there. She has an astonishing amount of work that can and should be followed on Instagram. Her beautiful dolls are perfect to look at and to serve as an inspiration. Melanie is one of the oldest customizers and perhaps the mother of customized eyechips. I remember those days, and I think I still have one of her first batches of custom eyechips. Her beautiful dolls and photos in a calm setting are a wonder to admire. Candy colors, bright settings, perfect compositions. It’s all the signature style of Caroline, the superb creator of beautiful custom Blythe dolls. You need to follow her and breathe her perfection. Original concepts, sometimes a little gothic, sometimes just poetic, Helen does amazing and unusual creations. Photos can’t describe her work well enough, so you should be able to see several videos on how her dolls work and how they are assembled. Beautiful dolls and beautiful photos are the work of a team of 3 called Another Blythe. They do very original work always paying attention to details and style. Last but not least and still in the beginning of her path as a customizer, Artic / beibeiji_doll is one of the revelations of 2017. Her work can be fun but also super original. Her cool girl is just amazing! So much fun on this Instagram account. Twenty customizers can’t even start scratching the surface of the Blythe customization world. I hope you can follow DollyCustom on Instagram and check many more customizers that we feature daily.